The Unity Health Graduate Medical Education (GME) program recently received full accreditation through the Accreditation Council for Graduate Medical Education (ACGME) for its four programs: Emergency Medicine, Family Medicine, Internal Medicine and Psychiatry. These programs promote public health and encourage scientific research, as well as an environment for scholastic excellence and enhanced patient care. The Graduate Medical Education program began in July 2015 and is located on the campuses of Unity Health in Searcy and Newport. The Emergency Medicine (EM), Family Medicine and Internal Medicine programs offer three years of intensive, hands-on training, and the Emergency Medicine and Psychiatry programs offers four years of comprehensive training. 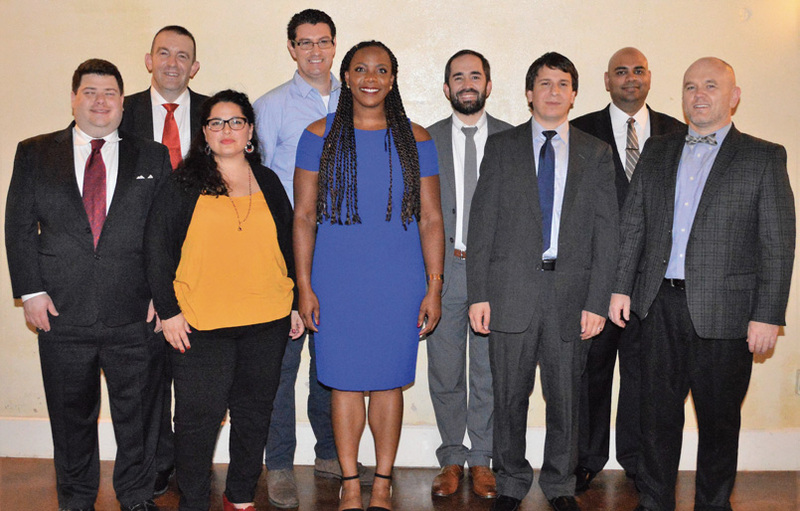 David Krapf (front, from left), Daniela de Vargas Boyer, Elise Griffin, Ziad Ghneim, James Bartley; James Aston (back), Enrique Camacho Jr., Wesley Cunningham and Mustafa Rayaz. Each of the GME training programs provides the resident physician with the opportunity to care for patients in their respective fields while under the supervision of a qualified and experienced Unity Heath physician. As an ACGME-accredited teaching institution, Unity Health provides higher quality care to patients through education, collaboration, faculty development and inter-professional relationships. Other benefits offered by GME programs include a resident continuity clinic, which provides affordable healthcare in a timely manner to those patients lacking a primary care physician. Oftentimes, appointments can be scheduled in one of the continuity clinics the same day, thus reducing the wait-time to see a physician. For convenience, resident continuity clinics are located in Searcy, Heber Springs, Cabot, Bald Knob and Newport. Delaney Kinchen, D.O., serves as the Emergency Medicine Program director at Unity Health, and he believes the educational experience offered at Unity Health better prepares the EM resident to practice in a diverse environment, whether it be a community-based emergency department or a high-volume, academic teaching institution. “As a program director, you are responsible for ensuring residents receive quality training expected of ACGME-accredited programs,” he said. Kinchen has an open-door policy and invites residents to share their experience and offer suggestions to improve the quality of their residency training.